He only reigned for five years. History knows him for a pathetic king and weak politician, who, according to the chronicler Rui de Pina (1440-1552), eventually died of plague and of sadness, a mental condition he fell into after Portugal’s disastrous campaign in Tangier in 1437. However, the story of Duarte, King of Portugal and the Algarve (1391-1438) is rather different than this first impression. The Portuguese ruler has been the subject of research in recent years (notably, the works of Dr Iona McCleery, to which this article is much indebted) and revealing new sides to the monarch. The Battle of Tangier was against Duarte’s advice and, far from giving into melancholy, the king was very aware of the danger to both body and soul of indulging oneself in excessive distress and worked hard to remaining happy and content. He even wrote a treatise on how to remain mentally healthy and the importance of being so: Leal Conselheiro, or The Loyal Counsellor. Although Pina’s presentation of Duarte is largely due to political propaganda, the king himself once was a victim to what we would call depression today. At the age of twenty-two, Duarte was charged with state affairs for about ten months when his father, King João I, was busy conquering Ceuta. 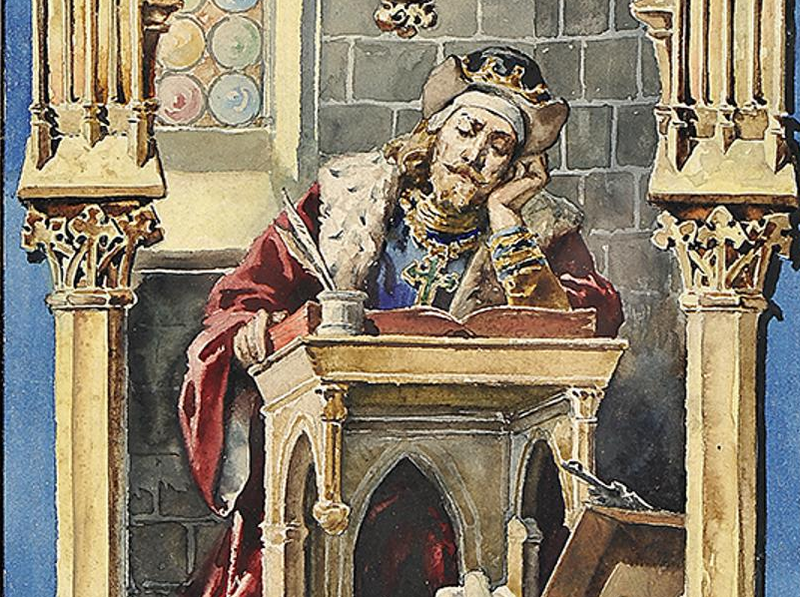 For a young prince whose life had been mostly spent on hunting and pleasant courtly activities, it is easy to imagine how stressful it must have been to carry the burden of the throne. Plus, his physical condition was probably affected, too, as his lifestyle suddenly turned from active to sedentary. To make things worse, a plague broke out shortly afterwards; Duarte fell ill and at times firmly believed he was going to die. Although he was restored to health, the shadow of death and the memory of people dying around him scarred his mind. Greatly afflicted, he started to wonder what it was like in the afterlife and to fear the unknown. He only recovered from this sorrow state of mind when his pious mother, Philippa of Lancaster, passed away. Her faith in God and calmness in the face of death soothed the young man; he came to the realization that the only way to cope with death – which is the fate of all men – is to live well. ‘To live well’, however, does not just mean to have a comfortable life and eat nicely and healthily. In Duarte’s opinion, it is just as much physical as spiritual, and it concerns one individual as much as the entire kingdom. Therefore, having tasted suffering himself, he decided to spare others of the same pain and mistake. The Loyal Counsellor is the result. In many ways, The Loyal Counsellor is a unique work, though on the surface it is easily dismissed as a mere collection of recipes and anecdotes. Genre-wise, it follows the tradition of the Mirrors of Princes (specula principum), but instead of being given advice by a courtier, Duarte does the giving. According to Dr McCleery, he is also the first to describe the emotion of saudade, a word the Oxford Dictionary defines as ‘a feeling of longing, melancholy, or nostalgia that is supposedly characteristic of the Portuguese or Brazilian temperament’. Duarte discusses this emotion to alleviate his brother’s homesickness. But most importantly, The Loyal Counsellor is a patient narrative. Though didactic in purpose, Duarte does not simply preach, nor does he present himself as flawless. Rather, he fully acknowledges both physical and mental illness: we are all different in temperament, in physical and mental condition, in life experience; it is okay to be weak and to succumb to excessive emotions, because we are not born perfect. The key lies in how to cope: we must, at some point, understand and face the pain. The pain will always stay, but it can stop hurting. To Duarte, the key word is contentamento, ‘contentment’. It is not just a mood, but a prudent way of life, and in the very centre of it there is God. The ‘loyalty’ he refers to in the title is loyalty owed to God. In line with Boethian thoughts, Duarte emphases that God gives as well as takes; material goods do not necessarily make one happy, especially if the individuals do not feel grateful for what they have. The mind must be fortified against the ever-changing nature of Fortune. It can be easily recognized that The Loyal Counsellor dwells on Duarte’s own experience of melancholy: he has had some stressful and traumatizing memories, which leads to depression, but he manages to accept these memories and make peace with the past, inspired by his mother’s faith in God. By putting these events in words, he now seeks to do the same. Duarte incorporates his personal experience of physical and mental health into state governing: deeply believed in the body politic, Duarte believes that the sovereign’s mental stability affects the stability of the kingdom, so it lies within a king’s duty to seek happiness. The Loyal Counsellor, therefore, reflects Duarte’s identity not only as an individual (or patient), but also as a Christian king. Ironically, it is precisely what happened: in Rui de Pina’s representation, Duarte’s troubling and short reign is indeed linked to his mental condition. To make Duarte die of sadness and depression, his reign is represented as a personal failure, rather than the failure of a dynasty.